Yes, this would be an awesome water hose for the garden hose hanger you choose from our large selection. Or maybe you already have your own. 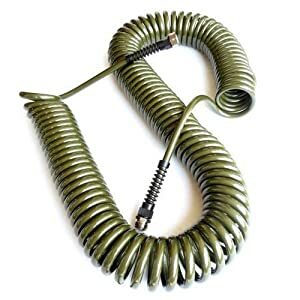 If you are looking for a special garden hose hanger specifically for a coiled garden hose, we have those, too. Specifications: Manufactured in the United States using top quality FDA grade Polyurethane. Commercial grade machined brass fittings are specially plated to prevent lead from leaching into the water. A truly drinking water safe product.